It’s that time of year when my mind starts to think about freshwater trout fishing. Ever since I was a kid, I’ve always loved visiting the Mammoth Lakes area. My grandfather started taking me up here when I was a lad of 12 years, and I’ve tried to make at least one trip back to those roots every year. There are a large number of comfortable motels or hotels in town, but I like to camp. My favorite camp areas are New Shady Rest or Old Shady Rest, located behind the new Visitor’s Center as you approach the first signal light in town. Turn right across from McDonald’s Restaurant and you’re almost there. These are great camp sites with clean restrooms, bear boxes for coolers, but no showers. I usually make a short drive up to the Twin Lakes store when I feel the need of a rinse, and it’s worth the three dollars it costs to linger under the hot water there. I use the campground as a base camp and travel daily to nearby fishing spots or to trail heads to hike and wet a line. You can make your day as easy or as hard as you wish, depending on your mood and the amount of energy you want to expend. Best of all, it’s a rare day when you don’t end up with a limit of fish if you want to keep them, or you can practice catch and release and stay busy most of the day. Let’s start easy. From town, drive back down to the freeway, head south a few miles and turn in at Benton Crossing. This leads to the Owens River. You’ll cross the river (it’s really just a stream, but they call it a river) and drive past the campground there to the second dirt road. This is one of my favorite places to start the day. The half mile road into the river is rutted, but you don’t need four-wheel drive to travel it. Once you reach the river there are several parking areas with access through or over the fence that was installed several years ago to keep the cattle out. This area is flat, dry, and usually hot, so take water or another cold beverage of your choice. One thing to note however: afternoon thunder storms can chase you back to the car when the sky lights up with lightening. 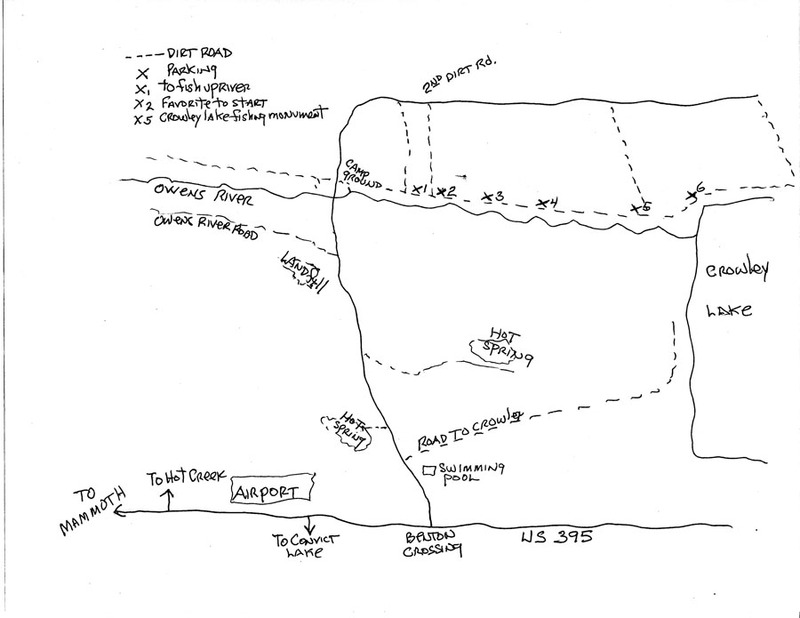 I’ve posted a rough map to help you get started if you’re not familiar with the area. No matter where you decide to start fishing, it’s best to work the slower, deeper water for the best results. 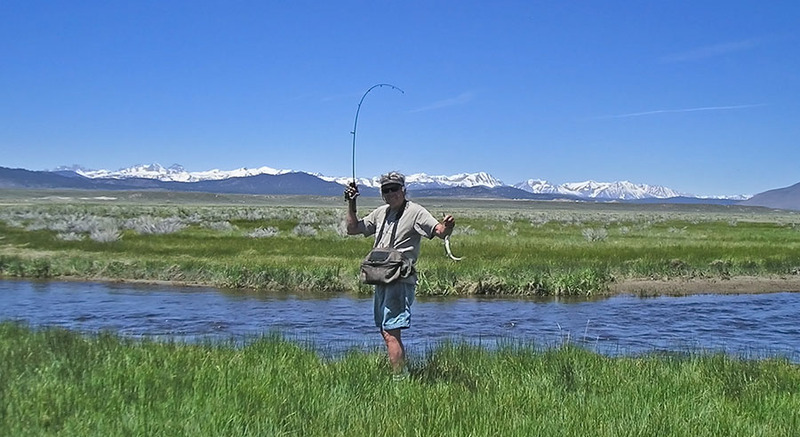 The river meanders down to Crowley Lake a mile and a half away, and it’s fishable all the way down. Check the regulations though, because they do change during different times of the year. You can fly fish, use lures, or float a bait, depending on which method you prefer, they’ve all worked well for me in the past. In fact my wife Pam calls this stretch of the river the meat market. It’s usually stocked with catchable size rainbows from the Hot Creek Fish Hatchery on a weekly basis, generally during the later part of the week. I suggest you park and then work the river, moving and fishing down with the current towards the lake. We usually have one member of our party drop us off and then drive the car a half mile down river to meet us later. The driver can then start fishing downriver, and when we get to the car it’s our turn to drive down and pick him up. About the first of October larger fish swim up river from the lake to spawn, and that makes the fishing interesting. The regulations change then too, so check them out, and be sure you stay legal because wardens commonly check fishermen that time of the year. On the way back to the campground you’ll pass the Hot Creek Fish Hatchery road on the right side of the highway just past the airport. This is a fun place to visit if you have never seen a hatchery. The kids always love feeding the leftover bait to the large trout there, or you can get a quarter’s worth of pellets from a machine and feed them. Watching the trout take the loose food you throw them always reminds me of the big one that got away earlier that day, it’s a blast. There are also a couple of hot spring pools off Benton Crossing Road that are popular spa spots as long as you’re not too bashful. Once back at camp you can cook or walk into town for dinner. You can even drive if you’re tired, but whatever you choose to do, there are plenty of places to eat nearby. Turn left at the light and you can get groceries at the Von’s market or buy a hot chicken or ribs for dinner. There are lots of restaurants in town to choose from, after all, Mammoth is a high end ski resort during the winter. Some of my favorite dining spots include The Stove for prime rib, Roberto’s for Mexican food, or Grumpy’s for a burger. For breakfast you can get a great cinnamon roll and other goodies at Schatt’s bakery to start your day. There are several sporting good stores available and lots of places for the ladies to shop too. Camping and fishing around Mammoth isn’t exactly roughing it, since you’re next door to all the amenities you could wish for. Still, it’s up to you. You can choose between being a true camper, or a part time camper and tourist, or anything in between. You can also get a backcountry permit at the Visitor’s Center and travel to the back country from one of the many nearby trailheads if you’re a true camping aficionado. I’ll give you some more hints on fishing the Mammoth area in coming weeks. I’ve always loved fishing around here, and if you elect to try it I think you will too. Otto Gasser grew up mostly in southern California and obtained his Doctorate In Educational Psychology from the University of California at Los Angeles (UCLA). He was hired as a professor to teach in the Department of Kinesiology and Health Sciences at California State Polytechnic University, Pomona, California, where he initiated a multilevel Scuba training curriculum on campus. Dr. Gasser spent 37 years at Cal Poly before recently retiring. During that time, he certified over 2,000 students in Scuba. He served as the University’s Diving Safety Officer and represented the campus on the California State College and Universities Diving Safety Committee. Off campus, Dr. Gasser spent ten years on the Board of Directors for the Los Angeles County Underwater Instructors Association, three of them as President. Over the years, he has volunteered time on a number of county Scuba training programs and has authored several articles about diver training. Otto is now an active recreational diver. In addition to the California coast, his more frequently visited dive locations include Hawaii’s Big Island, Indonesia, and the Caribbean islands. This entry was posted in Fresh Water Fishing, Mammoth Lakes Fishing Log and tagged freshwater fishing, Mammoth Lakes, Owens River, trout. Bookmark the permalink.